Last year when I found out I was heading to China, I knew I had to keep a journal, and I knew I had to make sure I remembered as much about the experience as possible. So I bought a Smash Book for journalling. I also bought washi tape, because, well, I needed tape to hold stuff in the journal. Now, I have been journalling since I was a teenager…. And I always keep a travel journal, but this was well, a new approach to the previous ones. 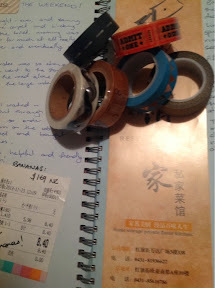 Not only did I fall for Smash Books completely… Love love love… But washi tape changed my life. From a couple of rolls just to hold stuff in, I then went crazy…. I bought so many. Now I pretty much use the stuff for everything. Need to decorate a card…. Washi tape. Need to journal…. Washi tape. Book too similar to everyone else’s… Washi tape. Hold a gift closed…. Washi tape. Set a theme…. Washi tape. The tape is smooth, and totally easy to use, it can be moved, repositioned, and still stick down. I imagine I’ll be using if forever… And probably buying far too many rolls. Is it possible to buy washi tape in Australia? Surely it is. I’m in New Zealand… I get mine from http://www.papervineshop.com/washi-tape/ as it’s the cheapest and best range I’ve found.